For first time skiers or snowboarders who have never taken a lesson, or beginners who are learning to ski/snowboard, the Adult Learn to Ski/Snowboard Online Special is designed just for you. Not sure what level of skier or snowboarder you are? Checkout our “What Level Am I” diagram below to find out. *If you feel you are confident and at an intermediate level, level 3 or above, the Adult All Mountain Group Lesson would be best suited for you. Easy Street, Sierra's lauded beginner terrain, is the perfect learning playground. With two dedicated beginner conveyor lifts, and gently banked terrain, Sierra's SMART TERRAIN® program is designed to take you through the fundamentals of skiing and riding so you feel confident on our green circle terrain and creates an environment where beginner skiers and snowboarders feel comfortable learning new skills. In addition, skiers and riders will be outfitted with beginner specific equipment from industry leaders, Burton and Rossignol. This equipment is designed to accelerate the learning curve so you will be making turns down Easy Street in no time at all. This 2.5 hour lesson is a relaxed, easy and hassle free morning - where you can arrive, get your kids into wild mountain, move onto getting your own tickets and equipment. This 2.5 hour lesson is our afternoon lesson which is designed for those who wish to have a later start. After registration and equipment fitting, attendees meet instructor ON THE SNOW 15 minutes before lesson start time (9:45 am or 12:45 pm) to discuss itinerary/lesson details. Save up to 50% off! This is the most affordable learn to ski or snowboard package in Lake Tahoe. There goes your final excuse to not get out on the slopes with the rest of your family! These packages are valid for adults age 13+, everyday. This package is available in limited quantities and must be purchased online 48 hours in advance of your lesson package reservation. 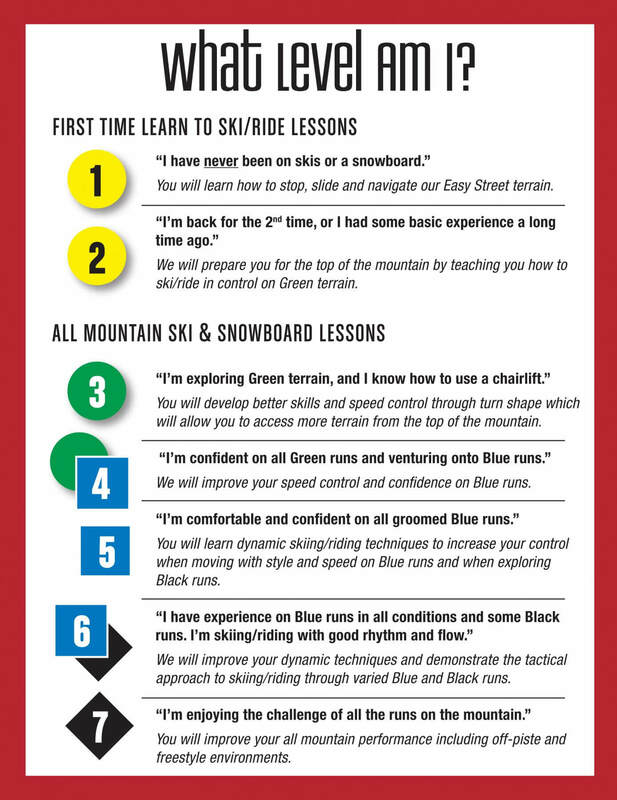 Valid for first timer skiers/riders only. Not valid in terrain parks. Please note that lessons are subject to selling out. While reservations are not required, we strongly recommended you make them at least 48 hours prior to your arrival. Please check in 1 hour before the start of your lesson. After pre-lesson registration and equipment fitting, attendees meet ON SNOW 15 minutes before lesson start time (9:45 am or 12:45 pm) with instructor to discuss itinerary/lesson details. Dress appropriately for the weather. Layers are best. Be sure you have eye protection (goggles for snowy days and sunglasses for sunny days). Hats, gloves, sunscreen and other items you might forget are available at the Sierra Mt. Sports Shop . Ski pants and helmet rentals are available at the mountain. Turn your adult or young adult Learn to Ski/Ride 3-PAK into an Unlimited Season Pass and Unlimited Season Rental with our Level UPgrade* and be transformed into that savvy shred guru you’ve always aspired to be. To make that smile even wider, we’re throwing in perks such as Preferred Parking, a Fast Pass, and discounts on grub, retail + gear from our partners, Burton and Rossignol. Now that you’ve mastered the basics, it’s time to master the mountain and take your skills to the next level.